​The Compound was an interactive social media game, played during HHN 24. While The Compound was vastly different than the popular Legendary Truth game, it did borrow elements of its game play from Legendary Truth. 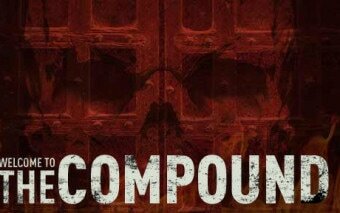 When The Compound site went live, an eerie radio transmission warned guests that in order to survive HHN 24, they must help fortify The Compound and strengthen the collective. The voice stressed that you were best suited to survive in numbers. Before HHN 24 started, The Compound had guests form "recon squads", and they were to hashtag their squad name throughout the missions, and game play. On The Compound website, guests were able to "enlist" for "recon missions", and get "survival guides". The Compound game was played every night HHN was held, and when guests signed up for a recon mission, they were taken to an RSVP page on Facebook where they would do just that, for that nights event. On the night of recon missions, The Compound would reveal on social media, and their website, the survival guide for the mission. The survival guides were maps of HHN. There were eight targets located in various places around the park. Beyond the first few survival guides, the targets on the map were marked with question marks. A short riddle was given for each target, to attempt to locate the correct corresponding target. When guests located the correct target, they were to go to the area on the map, take a photo of the target, then upload that photo to Twitter. When they did, they were instructed to hashtag the photos with their recon squad name, The Compound, and tag Halloween Horror Nights. ​Recon squads would receive "care packages" after completing recon missions. The care packages were essentially a goodie-bag of stuff, from Halloween Horror Nights. Most care packages contained a shirt with The Compound logo. Sometimes, HHN would add extra special items in the care packages, like screening tickets to Dracula Untold, and for the original Halloween (a special screening was held at the Universal AMC). The final recon mission care package, contained the Halloween collection of films on Blu-Ray.